Syracuse University S.I. 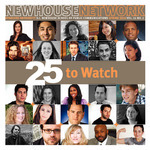 Newhouse School of Public Communications, "Volume 22 Number 2, Newhouse Network, Spring 2010" (2010). Newsletters from School of Public Communications - Newhouse Network. 6.